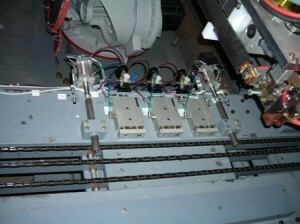 The purpose of the this machine is to perform intercell welding thru battery case partitions. Each 2 volt cell of a battery may be connected in series for a 6 or 12 volt rating. An operator will enter in the type of battery on the line into the touch panel. The operator will also start, control, and reset the equipment from the touch panel. Batteries will enter the cell from an existing conveyor to the left. Batteries will travel on a powered conveyor and travel to an air operated stop. The conveyor will stop until the welding section is clear. When the section is clear, a clamp will hold the battery behind the one to be released. The position of this clamp is set by a linear actuator. The stop will open, and the battery will be indexed forward until it stops at the welding section stop. The conveyor will stop, and the base will raise to battery off the chains. Positioners from the sides will then come in to hold the battery in a known repeatable position. The battery is thus justified in position for welding. The robot will then move the welding head above the battery, and lower to each thru partition connection. The welder jaws close, and the weld controller operates the inverter transformer to provide a solid current carrying weld between the cells. 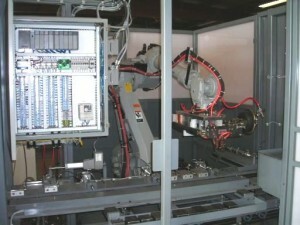 To see our Battery Intercell Welder Robot Videos please click here to request a private link.